I am 51, my wife is 40, we have been married for 5 years, this is the second marriage for both of us. We have 4 children: 17, 14, 10 and 10 (not twins) all from our previous marriage. Suburbs or an urban area (closer to urban than rural). I am an Executive in Compliance at a large financial institution and my wife is in middle management at a different financial institution. I have base pay, bonus, 401k matching and long term compensation in the form of cash (vests over 2 years) and my wife gets base pay, 401k match and bonus. Together we make over $450k per year. We have dividend income ($25k) that is 100% reinvested. I started out as a CPA (1990) and worked for a Big 4 (at the time) accounting firm making 40k per year. I would recommend any young adult to find a job that enables them to experience many different companies in their field of interest. I knew I didn’t want to stay in public accounting but the role allowed me to see large and small companies and the pro’s and con’s of each. I then took a role at a small regional bank, high visibility role but performed basic recurring finance role (Q’s and K’s and qtr financial statements). That got old to me quickly and I got the opportunity to totally change and work for a fortune 100 company making $100k per year (in 1997) but working in Manhattan. I didn’t save a high percentage of my base pay but did max out my 401k (got the company match) and saved most of my cash bonus. I did receive restricted stock awards and I saved 100% of them upon vesting. Through my career at this company I had roles within Finance (10 years), Risk (5 years) and Compliance (3 years). I didn’t like staying in one role too long, so once I delivered results and created relationships in a role, I looked for my next role. Developing relationships and delivering results are the areas I always focused on and were key to my success. Each time I moved roles I received an increase in overall pay, many times a promotion and took opportunities that other people thought were difficult and would set me up for failure but I took them if I felt I could develop a new relationship (I worked for the CFO, the Chief Risk Officer, and the Chief Compliance Officer) and I never doubted my ability to deliver results. When I was in my 40’s I had my most difficult roles but they also brought me the most income. There were years where I made $500k. The 40’s were my money making years and I was able to save over $100k per year (not good work life balance but I will get to that below) and I was fully invested in the stock market. I am a believer in experiences and relationships are much more important than masters degrees and schooling. I went to a small 4-year college and passed the CPA exam. School had nothing to do with my success. The relationship with a Partner at the Big 4 accounting firm, that I met thru a local business club I joined enabled me to get my first job. Whatever field you are in, I recommend not doing the same role forever. Look for different experiences to deliver results. Being able to get things done shows your engagement and commitment to success. If you get things done, your leader will give you more opportunities to succeed. Once you have gotten everything out of that job, look for another job (doesn’t have to be outside the company) that enables you to widen your network and show what you can do. It has changed a lot over my career. In my 20’s and 30’s I was all about work. I would work long hours to get ahead. I worked harder not smarter. When I got to my 40’s I worked smarter but was given a lot of responsibility which resulted in me working long hours and giving up vacations to be successful. Now in my 50’s I have great work life balance. I work from home a few days a week and still lead a highly engaged team that drives results. I started investing in real estate just recently (past 4 years). I wanted to diversify my investments, I was diversified in the stock market but wanted to have some real estate holding and had opportunities to buy some outdated homes. Not fixer uppers but they needed some refreshing. Small investment to get them where they needed to be. I was going to flip them but I ended up renting them and over the past 4 years have purchased 3 investment properties. One for cash, the other 2 I have loans on (with the low cost of funding and getting returns of over 10% in the stock market, and only 3% increase in home values in my area, I decided to borrow funds instead of paying cash). Gross income per year on rental property is $72k but liability payments on those home is $42k per year. Net $30K per year. I take some of the extra money and put towards the loans so that I can pay them off quicker. Rental income will be key to keeping my lifestyle throughout retirement. My philosophy has always been to enjoy life while you are young but not to the point where you can’t save. I have had a budget since I was 20 years old and back in the day my excel spreadsheets were famous with my friends for breaking out fixed and variable expenses and tracking savings. I never had a year where I spent more than I made. Currently I spend $185k per year, this doesn’t include the $42k on my rental properties I discussed above. I am a believer of ESI philosophy and budgeting. My wife will tell you I bug her about every expense that comes thru. You may be thinking with that much spending I can’t be bothering her to much….lol. But it is not about the fixed expenses but what we spend on vacations, cars, etc. The main categories of our spending are mortgage, cars, vacations, food, bills and utilities, health and fitness (we belong to a country club). My goal for when we retire is to reduce the spending to $120k per year ($10k per month). I won’t get into the details but this goal will not be a problem as kids go to college and leave the nest. That will ensure we never touch our principle. I used excel for many, many years but now I use a program my financial advisor gave me that is online and I link all my accounts (credit cards, bank accts, etc) to so that I can see my net worth, budget, including all transactions and investment returns daily. I don’t look daily but weekly to review budget and make sure expenses are categorized correctly. My wife and I sit down and review the budget quarterly to determine if we are on schedule for our savings goal. My wife and I still max out our 401k and health savings account but currently only save a small percentage of our income. Because I was able to save so much in my 40’s and the market is doing so well, my net worth continues to grow over 10% this year without me having to save a high percentage of my salary. I love cars and my wife loves to travel. Two expensive things I know. I have a Ferrari, Porsche and old corvette and my wife takes a girls trip every year with her best friend (Bali, Greece, and Australia in January 2018). Now that I am in my 50’s I am adjusting my stock/bond % and lowering my Beta to reduce risk. I have always been diversified in different sectors like technology, finance, gas, bio tech, energy, as the main ones. I adjust my sectors regularly as I am a believer that over time everything will come back to the mean (“reversion to mean” principle). Example, Energy is down 15% this year (don’t quote me on exact #). I know over time it will come back so I take opportunities to invest in energy now as the global growth will continue and I believe energy will have a good 2018 as it returns to its mean growth rate. I don’t make as much on the 300 point up days in the market, but I don’t lose as much on the 300 point down days either. I have had many investments over the years but buy and hold has been my best investment over the years. Not selling when the market crashes and instead having cash available to make investments during that time has been my best investment. At least monthly, but I have a financial advisor (good friend) who also looks at it for me and gives me his point of view. I know how you feel about financial advisors but he is excellent at his job. Spends a lot of time researching and talks regularly to me and all of his clients on what he believes will happen globally as well as in the U.S. He doesn’t push any products or stocks and he has beaten the market returns every year. As I mentioned above, I grew my net worth through investing early (I started in my 20’s) and although when I was younger I was more of a trader than an investor, I learned more through reading (mainly newspapers and magazines) the importance of investing for the long run and the years in which you have extra money, don’t spend it, save it and the years it is tight keep maxing out your 401k at a minimum. To be honest it was a slow and steady, didn’t make any large mistakes but didn’t try for the home run either. Being 5-6 years away from retirement I am just enjoying life, spending more than I probably should but never more than I make. Based on my future calculations (using conservative market returns and inflation) my net worth will grow approx. $300k per year, until I retire and then at $120k of expenses per year, it will continue to grow $100k per year. $3m was my target, so now it is maintaining and determining when to stop working. I enjoy working and as I mentioned above have a good work life balance where I can enjoy playing tennis and going to car shows, so I am thinking in the next 5 years I will stop working. My net worth will be over $4m when I fully retire. I don’t recall when I passed $1m, but my behaviors didn’t change because of the amount of money I had. I got smarter as I got older and invested differently as I noted above. This is a difficult one but my work/life balance in my 30’s is one of the reasons my first marriage didn’t work out. I can’t turn back the clock to see if I wouldn’t have put work first what difference it would have made on my personal life or net worth but if I could change anything it would be to enjoy life more then. I am making up for it now though. Follow the ESI methods and Earn, Save and Invest. It is simple but effective. Also, as I mention above, don’t panic when the recessions hit. This bull business cycle will be ending soon (hopefully not too soon) but the bear cycle will last 4-6 quarters if history stays true. Take the down years as opportunities to buy sectors that you know will come back. The “reversion to the mean” principle will hold true over time, you just have to be patient. As I mentioned above my plan is to retire when I don’t enjoy going to work every day or 57, whatever comes first. When my role at the fortune 100 company was eliminated I received a generous severance package that allowed me to reset and take a break. I really enjoyed waking up early and not worrying about work, but going to the gym, playing some tennis, taking a ride in one of the cars and doing things around the house. It was a preview of my retirement and I enjoyed every minute of it. I will have no problem walking away from work when I am ready. I plan on traveling with my wife, enjoy watching my kids start their careers and being active with tennis and car shows (I won’t be the guy with the Ferrari anymore). I have tried to plan for everything I can think of, college costs, weddings, and healthcare, but I know you can’t plan for everything. I am sure life will throw a curve ball but I can’t control everything and will deal with anything else as it comes. I am not worried, life is too short for that. My older brother was a CPA so I learned about basic finance from him and got interested in investing when I took a class in college on the stock market. I believe in teaching kids early, so my 17 and 14 year old both have investment accounts and are learning about stocks and investing. Both of them also have ATM cards and checking accounts so they learn how to save. I learned from my mistakes but mainly from reading a lot of newspapers (I am officially old) and financial magazines like Money and Fortune. Now, much of the theories in those publications I know but they haven’t changed much over 30 years. I want my kids to try, succeed and fail, and learn from both. That is in life and in creating wealth. I didn’t have a hero per se but I knew I wanted to have the finer things that life had to offer, and I knew I had to work hard to get them. I was born into a lower middle class family where my father worked 6 days a week and my clothes came from a second hand store. I appreciate all he did for us and he taught me a great work ethic. I grew up in Long Island, NY and went to the Hamptons in the summers with my friends (sharing a 2-bedroom beach house with 15 people). Seeing all the great cars, big houses and the way people dressed I knew I wanted that. That is what inspired me. My wife and I do believe in giving back and we support several local charities. One particular one near and dear to us is for homeless youth. There are over 250 kids in our school district that are in foster homes or homeless. We give money and time to help these kids because once they are 18 they may be on the streets and we try to help them with a skill to get them jobs so they can start on the ESI way. We have a trust (everyone should have a will) that will leave what we have left to our 4 children. We teach our children about work ethic, being inquisitive and exposing them to different careers. We have friends who are doctors, lawyers, finance professionals, real estate agents, nurses, etc. My friends and I encourage our kids to ask us questions about our careers and day to day jobs. My oldest is going to college to be a dermatologist and my 14 year old wants to be a surgeon. My hope is that they are more successful than we are and they don’t need the money. I am glad that I am not the only person with a vice for cars 🙂 Granted my vice is only a 45K vice. Sounds like yours may be a lot more expensive with a ferrari, vette, etc. I hope that your advisor is fee-only. If he is fee-based and is even a low 0.5% AUM for you, that is costing you $10,000 per year to your friend. Sounds like you have the knowledge to do this yourself. It’s going to cost you millions during your retirement if he is fee-based. Otherwise, sounds like you’ve been able to live a life well-lived while saving for retirement. I appreciate your advice to get out there and experience multiple jobs, bosses, etc. Make that three of us. Though I’m also only playing in the 45k zone. To some people cars are a status symbol or an appliance. But to some there the hobby of choice. These are the people that should consider a car splurge. Haha absolutely agree. I think so much of the personal finance community is perfectly fine splurging on vacations and trips… But not on fixed expenses like cars. I am just not a big travel guy. I like taking local (cheap) trips once or twice a year. Maybe do something bigger every two or three years. I save a lot of money on not going a ton of places. By the time my kids are older and we can travel with them my car will be paid off. But 2017 was the last year I could get a naturally aspirated, v8 sedan, with a manual transmission. Oh, and it fits there car seats in the back! I rented a Corvette for my 50th birthday for $500 for the weekend. It tampered down my fast car desire for a couple more years. I just can’t see paying $80K for a car even though we can. Maybe I will buy a used Porsche one day, but my wife hates cars low to the ground. She hated my 1998 Mustang GT. Very important! I really wish my parents believed in that advice. It’s impolite to ask directly (as if there’s a non direct route…) so it was a behavior that was quite frowned upon. I grew up in a lower class family too. When I was growing up, I saw other families with more money and less stress. I saw other families with fathers that were more patient, mature, intelligent etc. It inspired me to search for a better life + husband than the one I had. The awareness is important. I agree with your comments. With a Ferrari in the driveway I keep them level set by providing the details of the hard work to get there and that they can be whatever they put there mind to with hard work and dedication. Thanks for the comment. If cars are what make you happy and you can afford it then go for it! Great job! I also think it’s great that you talk to your kids and teach them about money. We also plan to leave our inheritance in trust to our kids but don’t want them to think that’s a shortcut to working hard and saving and investing for themselves. I think that’s one of our most important jobs as parents. Like you said, we also want to teach our kids about working smart–having some work/life balance and remembering what’s most important in life (and it’s not work!). Thanks for sharing your story!! Congrats on being almost-retired!! Nice interview! What is the online program that your financial advisor gave you? It’s been white labeled with his company name so I don’t know what program it is but most banks have a program where you can connect your credit cards and investment accounts to do your budgeting and net worth. You can do all of that with Quicken. At some point, they are all only as good as the historical information you have. Congrats on your success! However, I’m surprised that you were able to max out your 401k without running into the highly compensated employee limit. Did your company do something to help you around that? Very good call out. I did meet that threshold for a few years and my company did have a deferral program to offset that. Thanks for your comment. I read ALOT on personal finance, investing, and about those who achieved financial freedom. One of the key takeaways that has been consistent with most who achieved financial freedom is that there was 1 specific memory that helped keep them motivated over the long-term. It seems to me that this vision of the Hamptons when you were young kept you motivated to achieve the success that could bring you that eventual lifestyle. I wish you and your family continued success in your future! Those cars are quite the collection! Interesting interview and really makes you realize that if you love what you do, it isn’t so bad working a bit longer. Although I prefer retiring earlier than my 50s, it was incredible how much they will be retiring with. Agree with the enjoying my job comment. I wouldn’t be working if I didn’t enjoy going to work. Thanks for your comment. ESI, love the blog! Curious how you choose the pictures to accompany the blog posts? I do have a bit of fun with those! Really extensive in-depth interview. Congrats to MI39 on their success. Sounds like things are going quite well. I was wondering if he continues to like his work would he work beyond 57 because his wife will be 46 and may want to stop working. I didn’t read if they were retiring at the same time. No matter what excellent job. Yes I would consider working longer and will cross that bridge when I get there but my wife has been asking to retire already but she enjoys traveling and has a good work like balance job as well so she is only going to work a few more years, doesn’t have an exact timetable. Thanks creating this valuable content and I look forward to this series as well as you efforts in Rockstarfinance.com. I’m slightly torn with mixed emotions when I read these interviews. It starts with a bit of envy at the top line when networth is listed. I have to admit, keeping up the Jones’ flares up for a brief moment. I have to go back to my net worth and cash flow statements to bring myself back into alignment with my priorities. My emotion then switches to personal regret for not doing a better job investing, investment diversification and taking risk like the couples in your stories. Near the end of the article it blends into motivation and thinking of ways to make corrections for my future self. (except for the real estate part., I’m just not interested in this at all). Today’s post with a car guy brings out a bit more envy than normal. I completely understand about having the exotics when we are at an age. We can easily get in and out of them without looking like a old guy dufus. 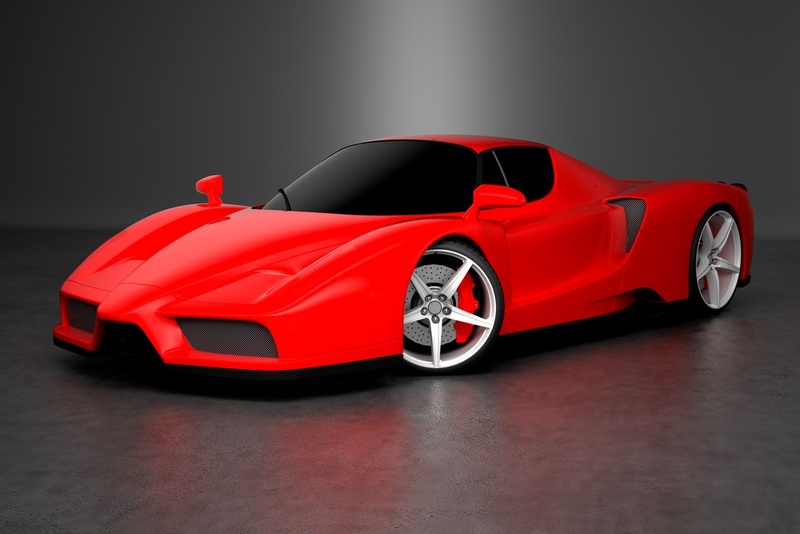 We also have comfortable cash flow to spend the money on service and upkeep, especially the Ferrari. I appreciate his plan to scale down in the future, but will he really? (there are car people and there are not). My biggest challenge with having a couple nice cars is where to keep them. My wife allows me to have any car I want as long as one fits in my side of the garage, thus, I only get one cool car. Keep up the effort. I really enjoy your contributions to our community. Your wife has a good rule! My husband has the option to acquire some bodies/parts of 2 antique vehicles that belonged to my dad, (d. 6 years ago). I also said he has to have a place to keep them first! Nothings is 100% but with the amount of travel we would like to do, I don’t think it would be a big deal to not have the Ferrari. I will still have a Porsche so still habe fun. You are correct about the cash flow. Thanks for your comments. I loved the perspective of experiences and relationships beating formal education and training. I recently took a position in one of the most challenging departments of my company. My thoughts were working in that department could be the equivalent of an MBA for my industry if I do well. Well done and as said, you could retire anytime now and be fine. It is not true in all cases but in my case it was. Good luck in taking that new role, deliver results and you will be a superstar. Thanks for your comments. Excellent job. Love the cars, I have similar “gearhead” guilty pleasures. your thoughts are on long term inflation, and what your budget is on the 10k? My program takes the expenses and increases them annually for inflation just as the investments have assumptions on growth. If your investments perform it will cover the expense increase. Thanks for your comment. I will never get there. Kudos, although I’m mystified by the cars. Clearly, you can afford your cars, so there is nothing wrong with having them as your vice. And kudos to you for hitting your net worth goal and surpassing it. I just moved to a new company. It’s good and very different from what I did before. It would take 5 years for me to get vested in pension plan. Should I be waiting that long in the same company and do different roles? I worked 18 years at the same company but moved roles every 3 to 4 years. Nothing wrong with staying 5 years with the same company if you have the opportunity to show your skills and build relationships. Thanks for your comments. Congrats on the success, great story. Love the new questions that are formatted into the new interviews, much more informative. Out of curiosity what program is it that you are suing that integrates budgeting and retirement planning? Is it available to the public? Seems like a mix of Mint.com and Personal Capitol. Great work! Glad to see a millionaire living a little. Sometimes it’s so easy to get caught up in accumulation and forget to enjoy some of the wealth that is made. My wife says YOLO!! = you only live once. You must enjoy the fruits of your hard work. Good that you are enjoying the fruits of your labor. Also refreshing to see the confidence of having it all figured out when the time to retire comes. I know of folks in family who have are absolutely insecure about retirement and continue working even with over 3M net worth. I don’t get into the details at all. I don’t feel they need to know anything about the details. Obviously they see the way we live (big house, Ferrari, vacations every year) but I have always told them that they need to create their own wealth and educate them on what that means. It seems to be working so far but only time will tell. My oldest daughter is starting college next year and has career aspirations and my 14 year old wants to be a Dr. They both have ATM cards and investment accounts (a few shares, nothing significant) but my thought process is to show them what it means to invest and save.